LibreOffice 6.2.2 provides over 50 bug and regression fixes over the previous version, contributed by a thriving community of developers, which are described in the change log page: https://wiki.documentfoundation.org/Releases/6.2.2/RC1 (changed in RC1) and https://wiki.documentfoundation.org/Releases/6.2.2/RC2 (changed in RC2). 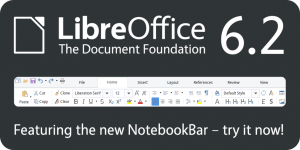 LibreOffice 6.2.2 represents the bleeding edge in term of features for open source office suites, and as such is not optimized for enterprise class deployments, where features are less important than robustness. Users wanting a more mature version can download LibreOffice 6.1.5, which includes some months of back-ported fixes. LibreOffice 6.2.2 is immediately available from the following link: https://www.libreoffice.org/download/. Minimum requirements for proprietary operating systems are Microsoft Windows 7 SP1 and Apple macOS 10.9. Builds of the latest LibreOffice Online source code are available as Docker images: https://hub.docker.com/r/libreoffice/online/. LibreOffice 6.2.2 is built with document conversion libraries from the Document Liberation Project: https://www.documentliberation.org. Why would anyone be interested in a release from 2018? Posted in portuguese language on the blog openSUSE & Open Source. Thank you so much, that’s awesome !!! “Berlin, March 21, 2018 – The Document Foundation announces …” should be 2019, correct? The help file is normally not available in Afrikaans. I download and install the English one, but when I try to use offline help, I am referred to the online one, as the Afrikaans version is unavailable. As most Afrikaans speaking people are thoroughly bilingual, I suggest that the installed English Help file should be made available. Thank you for an excellent office suite. The dedication of your developers is awesome. I know that a donation is most welcome, but as a pensioner and at our exchange rate…. You may be offended by my affordable contribution. Therefore I am truly thankful for your product and now and then offend you by my wee donation.